Developed by Australian developer House House, makers of the bizarre Push Me, Pull You, an untitled game starring a goose will allow players to cause trouble as a flappy waterfowl and terrorise a hapless gardener. 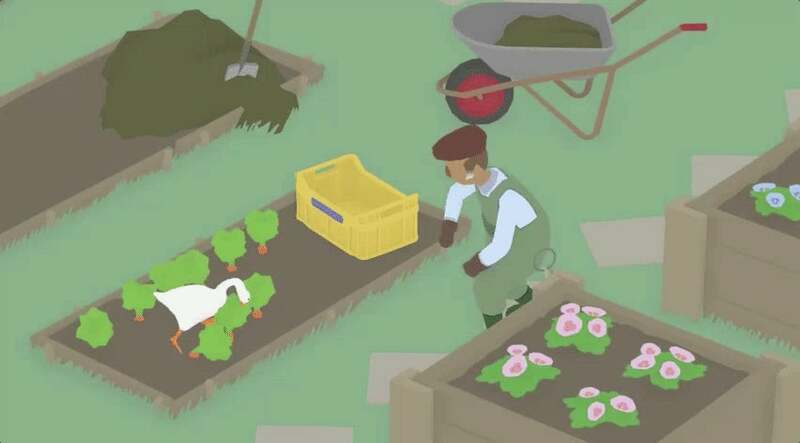 In some alpha gameplay, the goose can be seen furiously honking as well as engaging in some trickery to splash the gardener with his own sprinkler. The game doesn't have a playable demo or anything for the moment. It seems you'll have to wait until it releases in 2018 to get your fill of tactical goose-pionage action. As somebody who unashamedly loves watching goose attack videos, this game speaks to me. How can I give them money? Can't wait to have a gander at this later. I'm just gonna duck out of this one... seems like a rather unpheasant conversation. The beautiful swansong of the developer. Between this and golf story Australians must really like gooses. I'm curious whether it is still geese when used in reference to people being "a goose" are they being geese or are they all being goose's? Furthermore, if there is a group of people, are they goosing around or geesing around? I am trying to think if it would be weird or "interesting" to be goosed by a group of people. Well, to be fair, gooses/geese/goosi are a holes! Now give me a mod where I can be a bin chicken and I'm in.